The Best Carrot Cake Recipe – A moist and tender carrot cake with tangy cream cheese frosting. 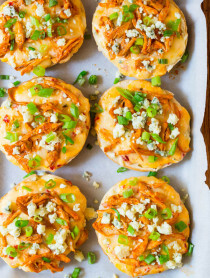 Easy to make and assemble, and always a hit at any gathering! Making a cake is not as hard as you might think. Those who are not experienced bakers often look at a photo of a layer cake and immediately determine they cannot achieve such results. Let me reassure you… You can make this cake. You can make it, and it will turn out just as eye-catching and delicious as mine. That’s part of what makes this recipe so appealing, in my opinion. It’s easy to bake, easy to frost, and is coated with toasted coconut around the edges to cover any imperfections. No fussy piping techniques necessary. Most cakes with fresh fruit or vegetables in them come out super moist, sometimes too moist, if that’s possible. This makes the cake a bit too dense for my taste. This is not the case with this carrot cake! 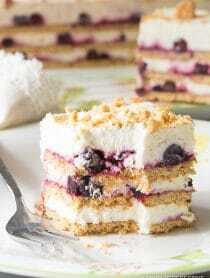 It is perfectly tender and oh, so delicious! Why Is This The Best Carrot Cake Recipe? 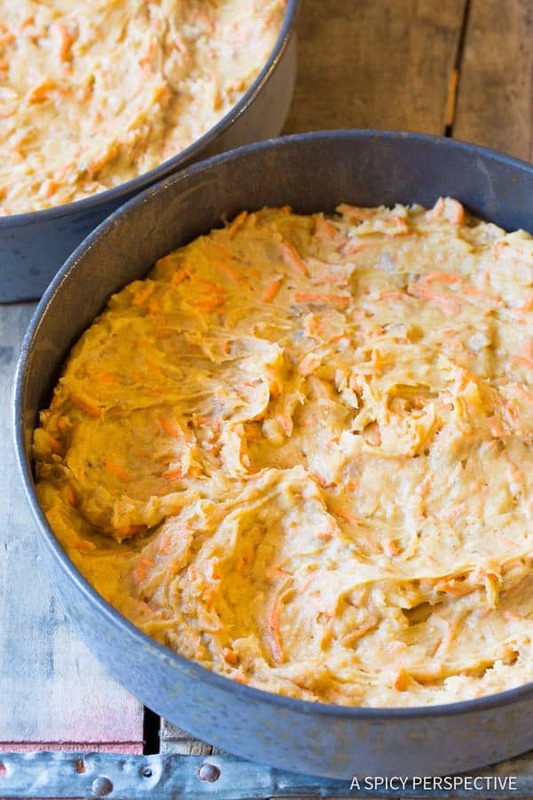 1) This cake is perfectly moist from the addition of coconut oil and fresh shredded carrots. 2) It has a lovely earthy flavor from the carrots and nuts, mixed with a tropical note from the coconut oil and shredded coconut. 3) This Carrot Cake Recipe is not overly sweet. Some carrot cakes have additional fruit and sugar. I like to take it easy on the sweetness, to let the natural carrot flavor shine… And to offset the frosting. 4) The frosting is super creamy and tangy. Made with more cream cheese than butter, the tangy-sweet frosting is the perfect complement to the cake layers. 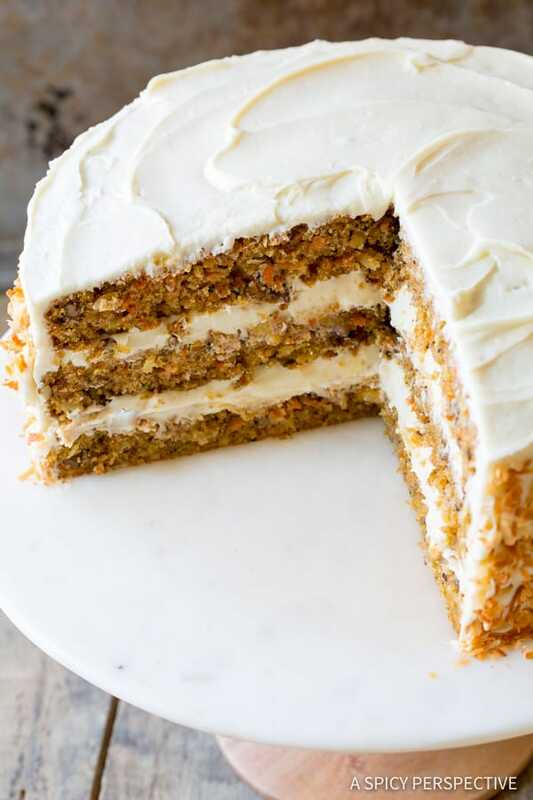 You won’t be knocking the frosting off of this carrot cake! 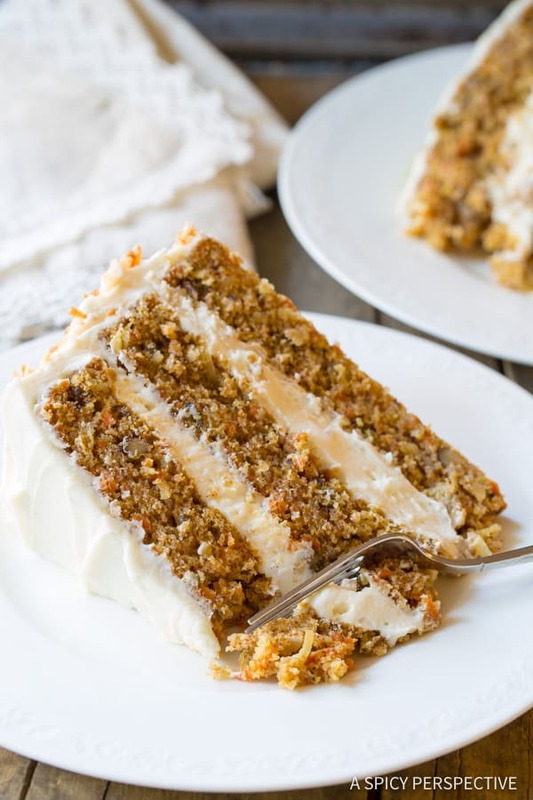 Just be sure to measure the ingredients accurately and you will end up with a rich moist carrot cake that will have all your friends begging for the recipe. In fact, I’ve had a couple of carrot cake haters, tell me this is the best carrot cake recipe they’ve ever tasted as well. 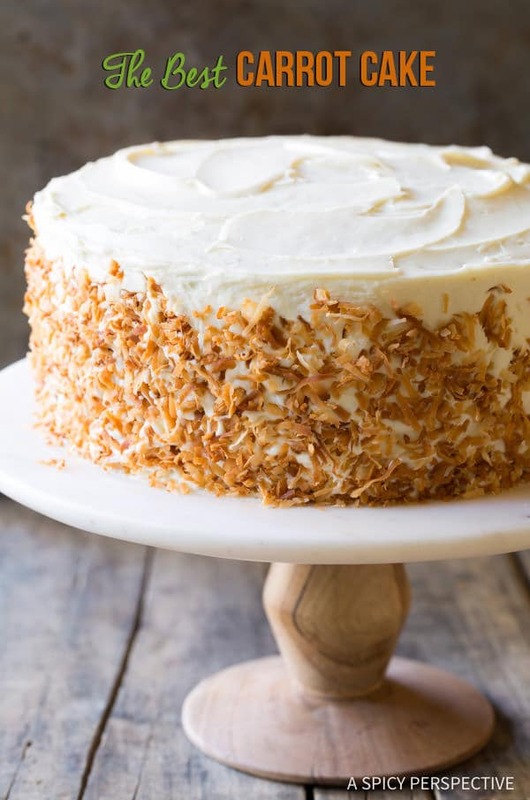 Finish off this amazing cake with cream cheese frosting and toasted coconut shreds. This makes the carrot cake look effortlessly gorgeous! 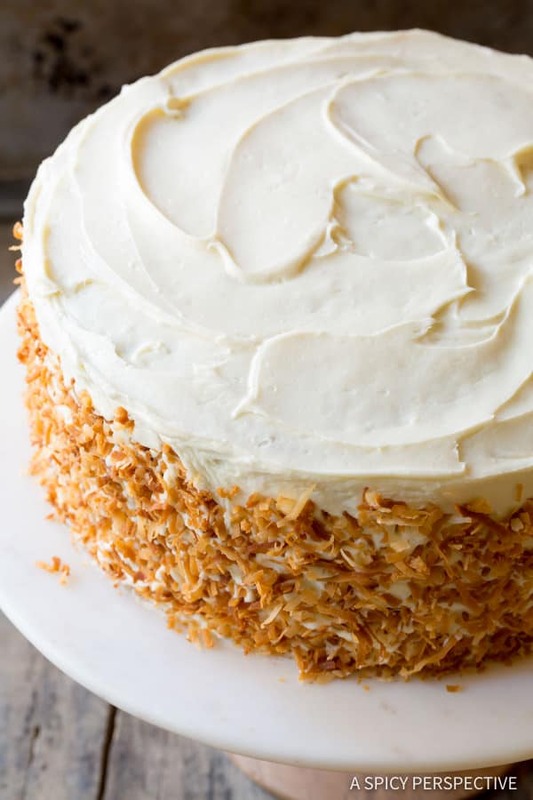 If you absolutely hate coconut, the solution is just to omit the coconut from the batter and from outside of the cake. It won’t look as pretty, but will still taste great! The Best Carrot Cake Recipe is a great dessert to serve for Easter… Or pretty much any other day of the year. Why not give it a go? You can do it! See The Recipe Card Below For How To Make The Best Carrot Cake Recipe. Enjoy! 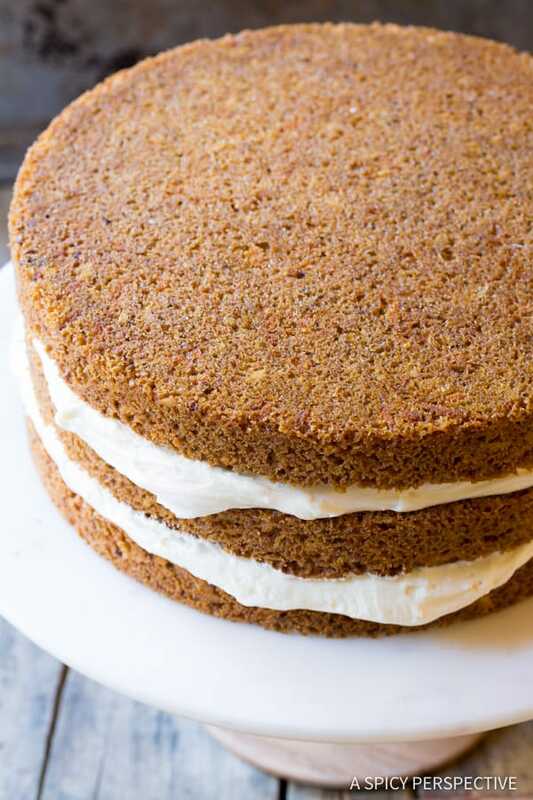 The Best Carrot Cake Recipe - A moist and tender carrot cake with tangy cream cheese frosting. Easy to make and assemble, and always a hit at any gathering! Preheat the oven to 350 degrees F. Spray three 8- to 9-inch round cake pans with nonstick baking spray and set aside. Pour the flour, sugar, cornstarch, pumpkin pie spice, baking soda, and sea salt in the bowl of an electric mixer. Mix briefly, then turn the mixer on low and pour in the melted coconut oil, eggs, and vanilla. Scrape the bowl and turn on low again. Mix in the shredded carrots, coconut and chopped nuts. Equally divide the batter between the three cake pans and smooth flat. Bake for 20-25 minutes until a toothpick inserted into the center comes out clean. Cool for 5 minutes in the pans, then flip the cakes out onto cooling racks and cool completely before frosting. 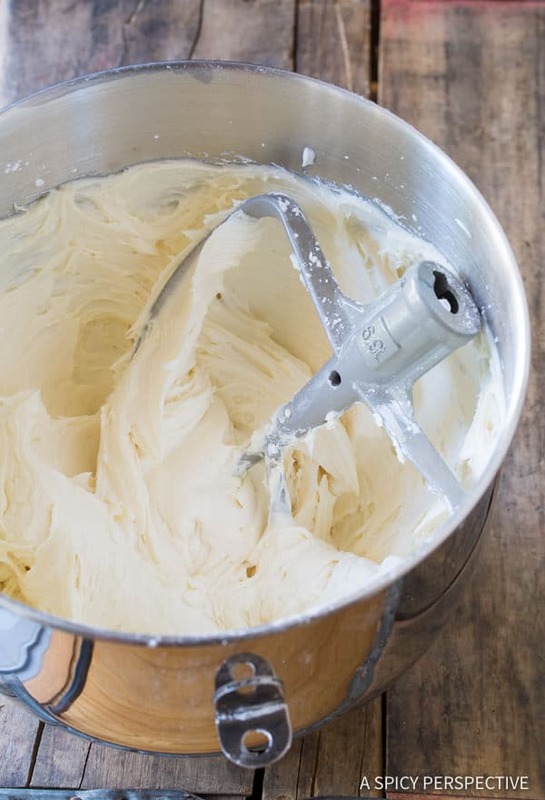 In a clean mixing bowl, beat the softened cream cheese and butter together until very smooth. Scrape the bowl and beat again to be sure there are no clumps. Turn the mixer on low and slowly add 7 cups powdered sugar. Then beat in the vanilla and salt at a higher speed. If the frosting is too loose, beat in one more cup powdered sugar. To toast the coconut, spread it out flat on a rimmed baking sheet. Place in a hot 350 degree oven and toast for 4-7 minutes. Watch the coconut carefully, it burns fast! Cool completely. Spread 1/4 of the frosting evenly over one cake. Top with a second cake layer, then spread 1/4 of the frosting evenly over the second cake. Top with the final cake layer and press gently to even out the layers. Using a long spreader, spread the frosting that comes out from between the layers around the edges to create a "crumb coat" to catch the loose crumbs. Then scoop the rest of the frosting on top of the cake and spread in down over the sides, and then neatly over the top. Press the toasted coconut into the sides. As with most cakes, you can keep this carrot cake out at room temperature for 3-4 days, covered. To prolong its shelf-life refrigerate, but always serve at room temperature. Leave it out on the counter for several hours before serving to warm gently. Best carrot cake I’ve ever made! My husband absolutely hates coconut. Is there anything that I could use in place of the coconut? I absolutely love love your recipes! You are my go to person when I am looking for something delicious to make. Your recipes are healthy, innovative, unique and each one comes out great. Thank you for the time and effort you take to make sure your measurements and directions are correct. I know that is not an easy task. Thanks again. Very nice recipe but may I ask why the addition of the cornstarch? I have never seen this in a carrot cake recipe and been making them for years. Also, I use brown and white sugar plus the addition of 3/4 cup of drained crushed pineapple in my batter. Everything else is pretty much the same with the coconut and pecans. I will try the coconut oil next time rather than vegetable oil. Your frosting recipe is exactly the same as I use. Thanks for sharing. The cornstarch is used instead of a small portion of additional flour to mimic cake flour. Anytime I have posted a recipe using cake flour in the past, I get questions about substitutions. It seems many people can’t find it. Therefore here I just listed the best substitution in the recipe, AP flour + cornstarch. You could definitely skip the cornstarch and use just shy of 3 cups cake flour. First time making a carrot cake and I must say it was excellent, our whole family enjoyed it. The only thing i did was take down the icing sugar to 1 cup and used 1/2 on a chocolate cake. This looks really good and I’m going to try it for our traditional ‘bunny’ cake! Can you clarify if the coconut used is sweetened coconut or unsweetened coconut? Thank you so much for sharing this recipe! This looks amazin! can’t wait to try it! I’d like to make it for a party we’re going to this weekend but I’m thinking and 9 x 13 cake pan will be easier to travel with. Any suggestions? Follow the same recipe? 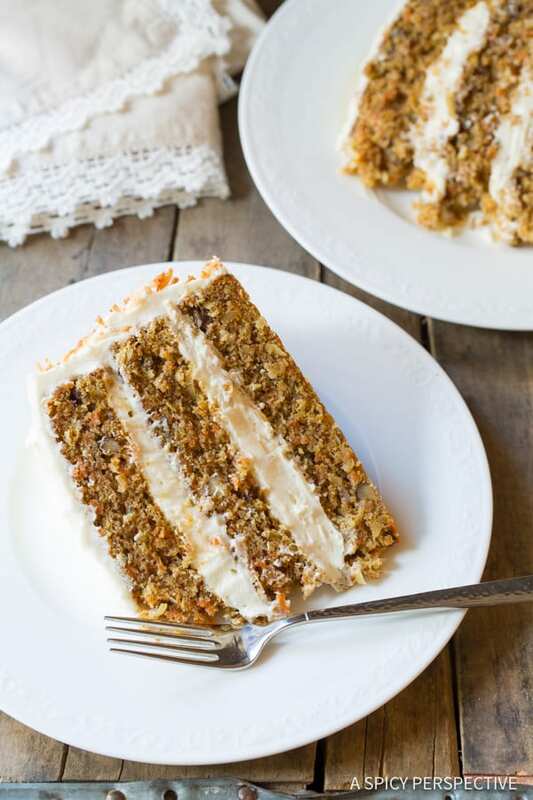 Carrot cake is my #1 favorite dessert (ok, it’s tied with cheesecake, but if it were on a menu alongside cheesecake, I’d definitely go for this). 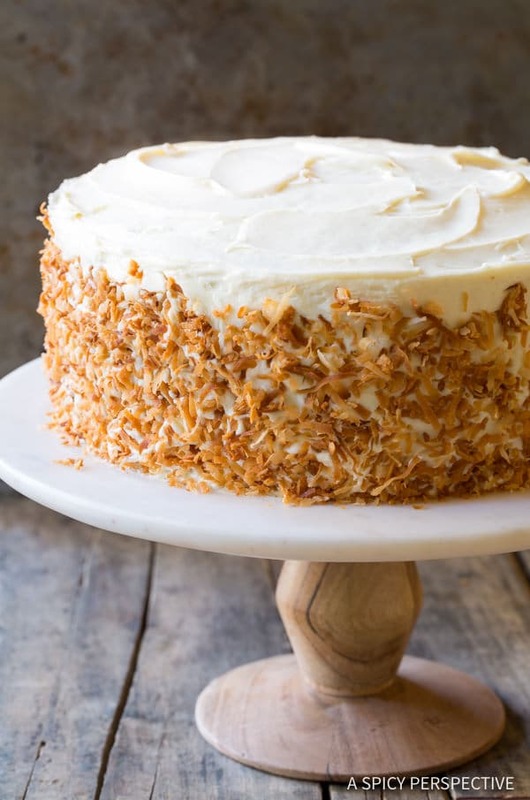 This looks absolutely perfect (especially the shredded coconut coating… I just can’t get enough). It’s a beauty and a perfect Easter dessert! This looks delicious, Sommer! I may just be serving this for Easter! Hi Lisa! I usually measure out the congealed coconut oil, warm it until it’s liquified, then stir in a little extra to even out the measurement. Happy Baking! 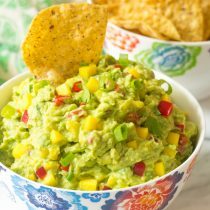 This recipe looks amazing and I love that it uses coconut oil. What do you think about using brown sugar instead of the granulated? Would you use the same amount? 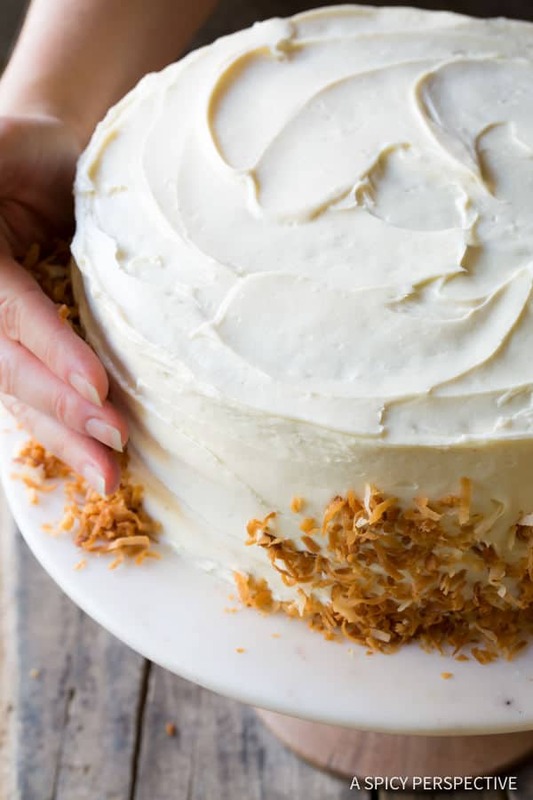 That toasted coconut sends this cake right over the edge! can i use 1 cup applesauce 7 1 cup sugar in place of 2 cups sugar? I do love a classic carrot cake, my family would be so happy for me to bake one today! Thanks for making it look so easy! I adore carrot cake, but always feel like it’s a huge undertaking. 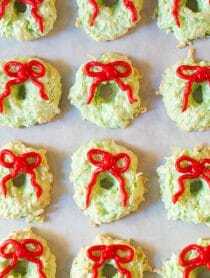 I seriously can’t wait to make this! Brilliant. One of my favorites. I love that it’s not too cloyingly sweet. That’s always my problem with carrot cake. Love the way you’ve dressed the sides as well. I love the addition of coconut oil and coconut inside the cake. I’ll bet that takes it over the top. Your photos are lovely!